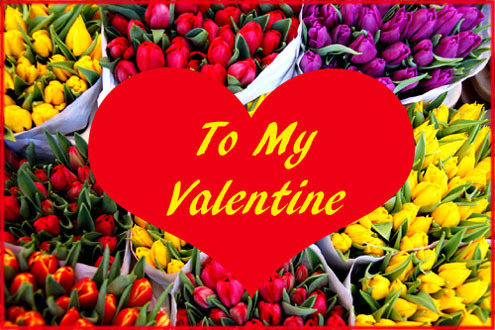 • Find your free Valentine cards here in this big and varied gallery of beautiful Valentine day cards. 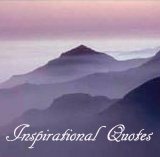 • Get lots of inspiring, sweet and romantic Valentine poetry you can use in your Valentines cards for that special someone. 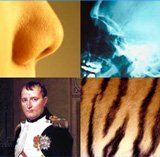 • Also read short resume about the fascinating history of sending Valentines Day cards. A tradition that is much older than you might think. 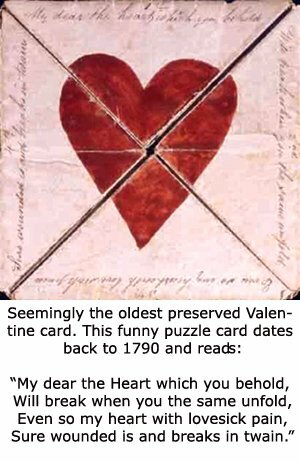 The tradition of letting your beloved know that she (yes, originally Valentines cards were made by men) was in your heart and you mind goes back more than just a couple of hundred years. In fact we have to embark on a long journey through time all the back to the Middle Ages. The Middle Ages make out the first tender years of Valentine greetings. 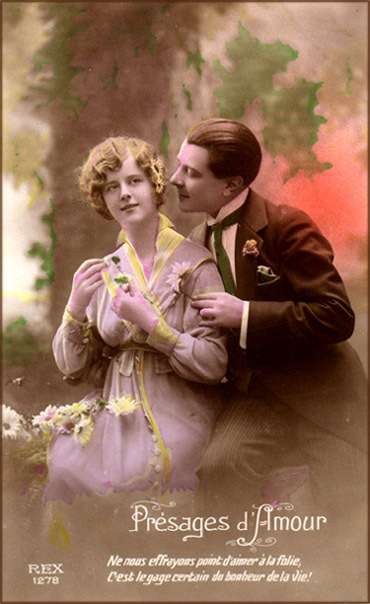 Here Valentines were slowly being established as an oral tradition between intimate partners. Lovers would either sing or say their Valentine blessings out loud to each other as a token of their love. 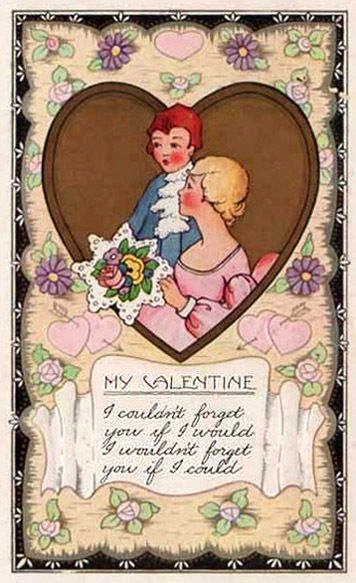 The first written Valentine is believed to have been made by the Duke of Orleans, Charles, back in 1415. Being held imprisoned in the Tower of London he spent some of his time writing a Valentine poem to his wife. After the 1500s the Europeans slowly began adopting the tradition of sending the person they fancied a written Valentine Card on paper. Particularly the British seemed to be very quick to take this new trend of written Valentine in stead of having to sing out their love. 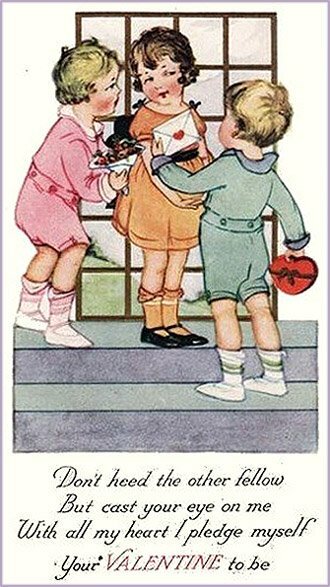 Now that America was catching up with the European Valentine's tradition, "writers" were being made en masse and shipped over to the enthusiastic Americans. 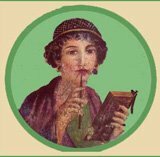 "Writers" are not persons who write but small books of Valentine poetry compilations. In this book men could find inspiration and suitable Valentine poems and messages to write in their love letter and practically enough, women could find proper answers to their wooer. 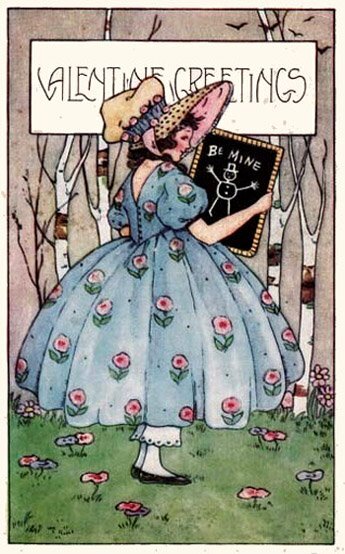 Due to the fast technological advancements in the second half 1800s, Valentine's cards were now being mass produced and made available for all social classes. The mass distribution of the popular Valentines was also aided by the fact that it had become much cheaper to send a Valentine greeting. So now things were really easy! 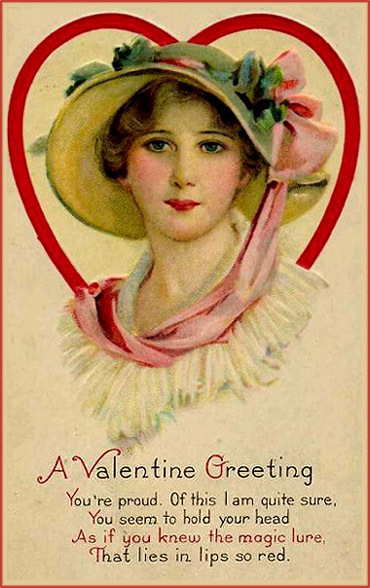 Not only did you not have to be born in high society, you could also be as tone deaf as a earthworm in mating season while at the same time be a complete dyslectic as many of the Valentine cards had pre-published Valentine poems written on them. Here are some interesting numbers to show you just how popular Valentine Cards or Valentine pictures have become. The Greeting Card Association claims that each year one billion love stricken people send out a Valentine to the person of their dreams. This number is only beaten by Christmas cards. But it is also beaten by far! It is estimated that during Christmas, 2.6 billion Christmas cards are sent out, wow! Also according to Wikipedia the Internet is now pulling some of the weigh of sending Valentine cards. 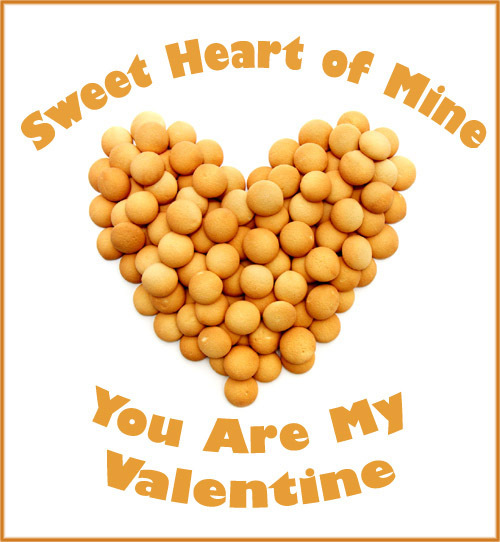 In 2010 it is believed that about 15 million e-valentines were sent to lucky love receivers. And interestingly enough today most Valentine Day cards are being sent by women (85%). 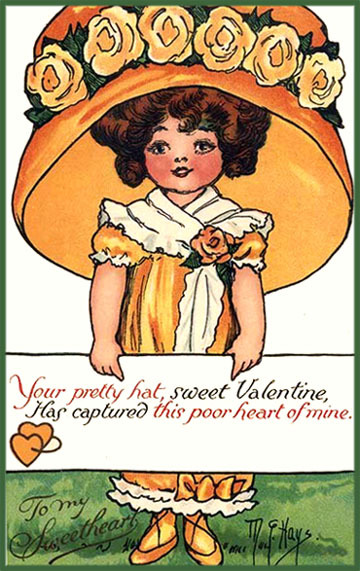 This was a quick resume of the history of Valentine greetings, now we will leave the scene for some wonderful free Valentine cards and Valentine poetry - some of these are also high a quality that they are suitable as Printable Valentine Cards. 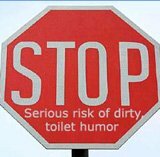 Please note however, that while we wish for you to enjoy using these Valentines Pictures for your own private purposes, they are not to be used commercially. Thank you for understanding. Sharp, clear photo of a heart shaped stone in the color of amber, orange / brown. Old drawing of a woman in a big blue dress with decorative pink flowers and a big hat with a pink ribbon. The woman is standing on a green lawn among birch trees holding up a small blackboard with a simple stick figure drawn on it. 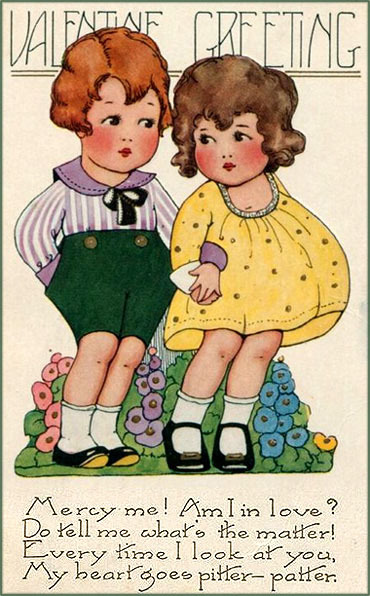 Sweet old drawing of little boy in green shorts and little girl in yellow dress looking at each other and holding each others' arms. 'Mercy me! Am I in love? 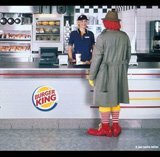 Do tell me what's the matter! 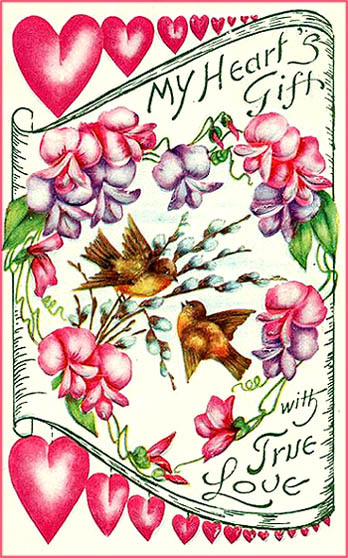 Colorful drawing of two brown sparrows flirting among lots of pink and purple flowers and pink hearts. 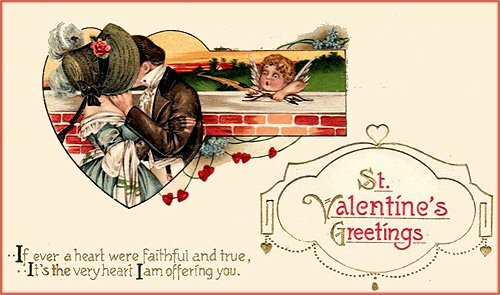 Old vintage Valentine card featuring a man kissing a woman and a small cupid with wings, bow and arrow looking at the scene behind a red brick wall. A forest or garden scene with a dark haired cupid with a green pitcher watering a heart consisting of red roses in the middle surrounded by white marguerites. On the Valentine picture you can also see two decorative white doves. 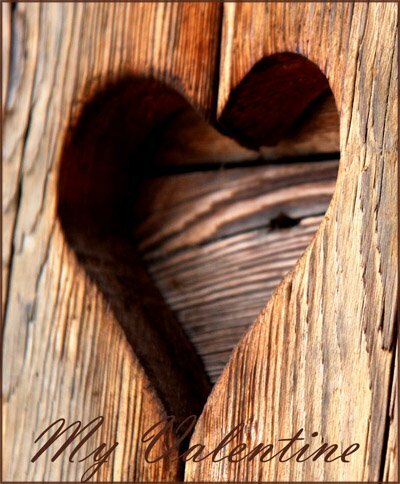 Modern photo of a heart cut into two wooden boards, probably on a door. 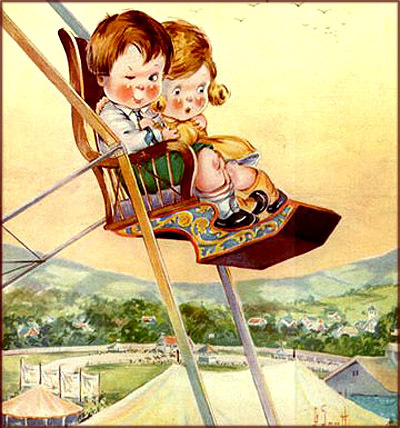 Very old drawing of little boy sitting in a Ferris wheel winking at the reader. The little boy holds his arm around a scared looking little girl comforting her. 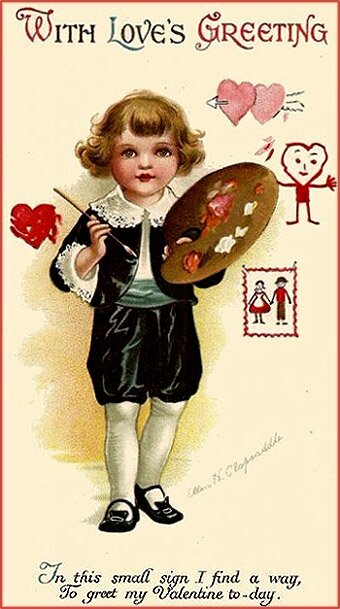 Beautiful Valentine picture of a little boy with a painting brush in one hand and a painting palette in the other hand. 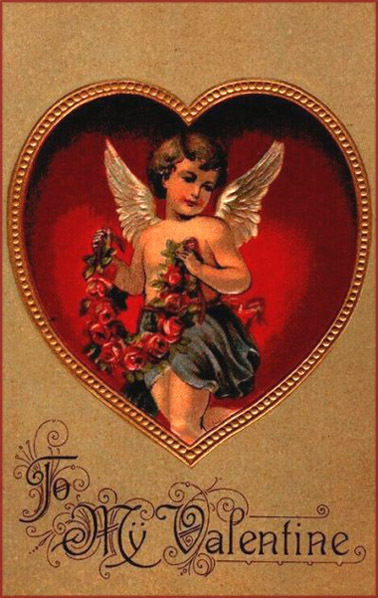 Very old Valentine card featuring a love cupid inside a red heart with a string of red roses in his hands. Old vintage drawing of little girl and two small boys. One boy in blue offers her a love letter and a red heart. The other one in pink offers her a bouquet of flowers. Lucky girl! But cast your eye on me. 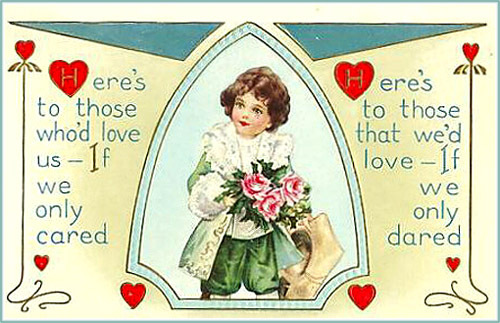 Valentine picture of little boy in green holding his hat in one hand and a bouquet of three pink roses in the other. - If we only cared. Modern close-up photo of the insides of a big box of chocolate. 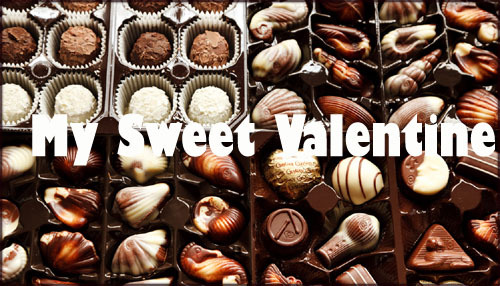 Lots of decorative chocolates in different shapes and in both brown and white. Colorful old drawing of a little girl or a young woman all in yellow / orange costume. She is wearing an orange dress with an orange rose and big bell shaped hat with lots of yellow roses. Drawing of man in blue and a woman in pink dress and a pretty bouquet of different flowers. Both are sitting inside a brown heart. Old brown photo with a few decorative specks of color here and there. The motive is a man leaning over a woman as if he intends to kiss her. The woman is holding a flower in her hand. Photo of a red shiny heart in a string on a pink background and a garland of purple and pink pearls. 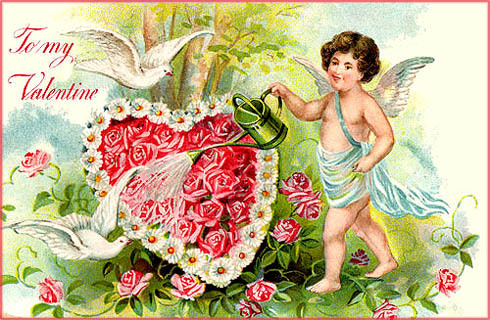 Old painted Valentine picture two cupids with butterfly wings standing on a cloud. 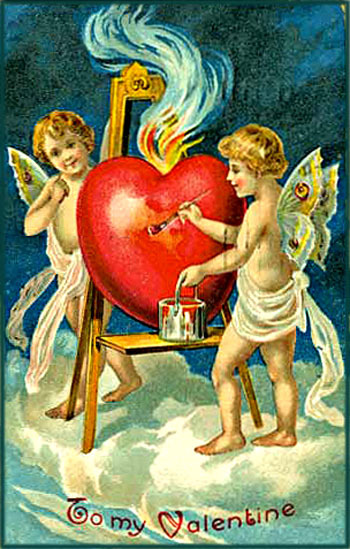 The cupids are busy painting a red heart that is on fire. 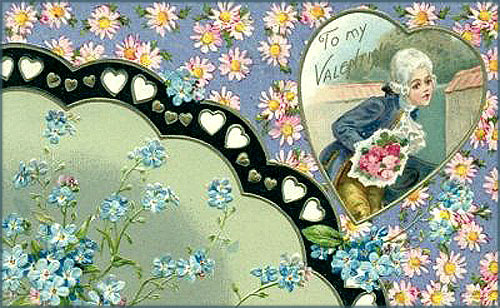 Very old Valentine card featuring a young man with a bouquet of pink flowers. 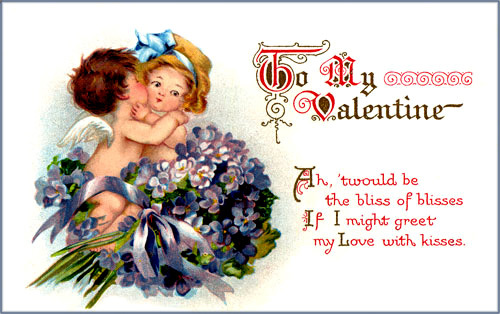 Vintage Valentine image with two cute cupids hugging in a big bouquet of purple flowers. 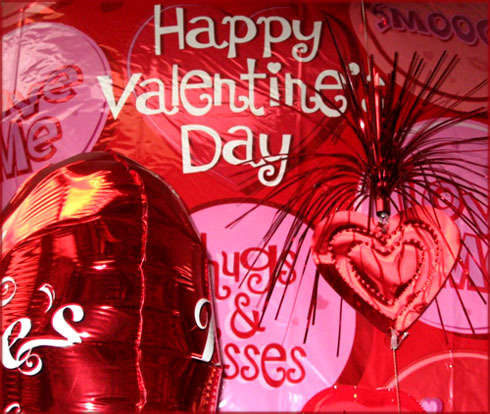 Photo of red balloon with other Valentine decorations. Detailed portrait of a young woman with a hat and a pink ribbon. She is framed by a red heart. 'You're proud. Of this I am quite sure. 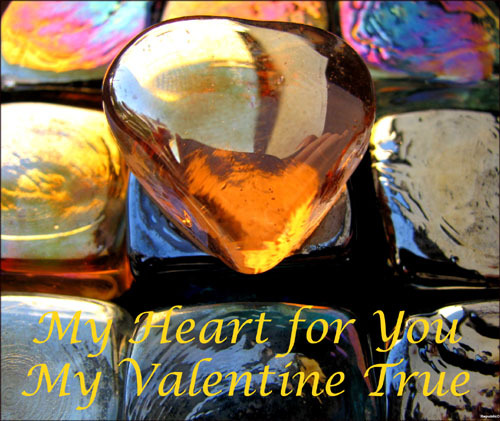 Free Printable Valentines Cards, Beautiful Valentines Day Pictures & Inspirational Valentine Poems. 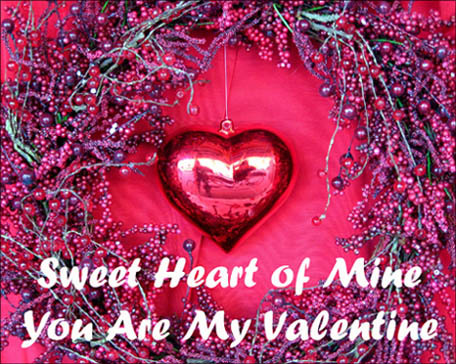 Sweet Valentine Poems and Romantic Valentines Day Poems for You to Use in Your Valentine's Cards.